The Secret Science Club: The Secret Science Club presents Biologist and Biosphere Expert Tyler Volk at the Bell House on Wednesday, November 5 at 8 pm FREE! The Secret Science Club presents Biologist and Biosphere Expert Tyler Volk at the Bell House on Wednesday, November 5 at 8 pm FREE! Secret Science Alert: This month, the Secret Science Club will be meeting at the Bell House, an all-new all-awesome venue in Gowanus, Brooklyn, created by the owners of Union Hall (our lovely hosts). Where will you be on the night after the presidential election? The Secret Science Club is “ready on day one” with more Earth-shattering lectures, flaming cocktails, and scorching-hot sounds. Without carbon, we are nothing. The fourth most abundant element in the Universe, carbon is in the soil, the air, the oceans, the cells of every living thing—and unfortunately in the fossil fuels we burn. As fossil fuels are combusted, they release carbon atoms that have been locked underground for millions of years, causing gigatons of CO2 to enter the global carbon cycle. Biologist Tyler Volk is science director of the environmental studies program at New York University, the author of a just-released book CO2 Rising: The World’s Greatest Environmental Challenge, and the guitarist for the all-scientist rock band, the Amygdaloids. For more than 20 years, his research has focused on the global carbon cycle, the dynamics of the biosphere, and closed ecological systems for life support. Dr. Volk asks: How is CO2 changing the natural world? Can new technologies and new energy sources—carbon sequestration, biomass, solar, wind, and nuclear—hold back the carbon tide? Why are the exhaled breaths of the growing human population not net additions to atmospheric CO2? How much carbon can the world’s oceans and forests hold? What facts should every Earth citizen know about the carbon cycle? 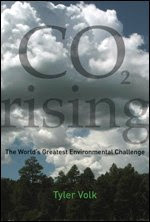 --Stick around for the blistering Q&A, and pick up a signed copy of Dr. Volk’s new book: CO2 Rising—it's hot off the presses. The “Secret Science Club” meets November 5th at 8 pm @ the Bell House, 149 7th St. (between 2nd and 3rd avenues) in Gowanus, Brooklyn, p: 718.643.6510 Subway: F to 4th Ave.